A 32-year-old male presents with mild jaundice and flank pain. He recently developed sinusitis, which was treated with trimethoprim-sulfamethoxazole, but is otherwise healthy. His hemoglobin is 10.2 g/dL (13.5-17.5), MCV is 90 μm3 (80-100), and total bilirubin is 3.4 mg/dL (0.2-1.5). 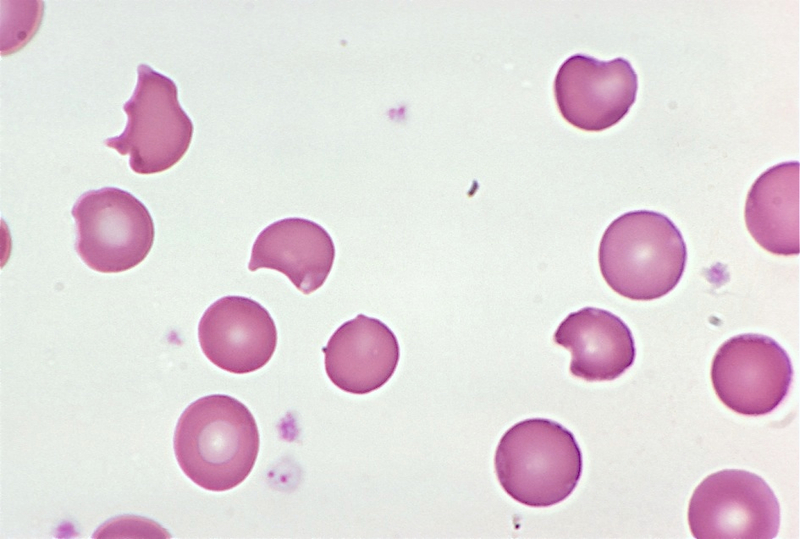 A representative field from his blood smear is shown here. What is the most likely diagnosis? The answer is glucose-6-phosphate dehydrogenase (G6PD) deficiency. G6PD deficiency is an X-linked recessive disorder in which patients produce decreased amounts of G6PD, a red blood cell enzyme involved in detoxifying free radicals. When a patient with G6PD deficiency is exposed to an oxidant stress (which can be anything from an illness to ingestion of certain foods or drugs), the resulting reactive oxygen species attack structures within the red cell. Globin chains are particularly vulnerable to oxidant damage. They become denatured and stick to the inside of the red cell membrane, forming inclusions called Heinz bodies, which are visible on crystal violet staining. Heinz bodies are removed by macrophages in the spleen, leaving visible “bites” in the red cells. 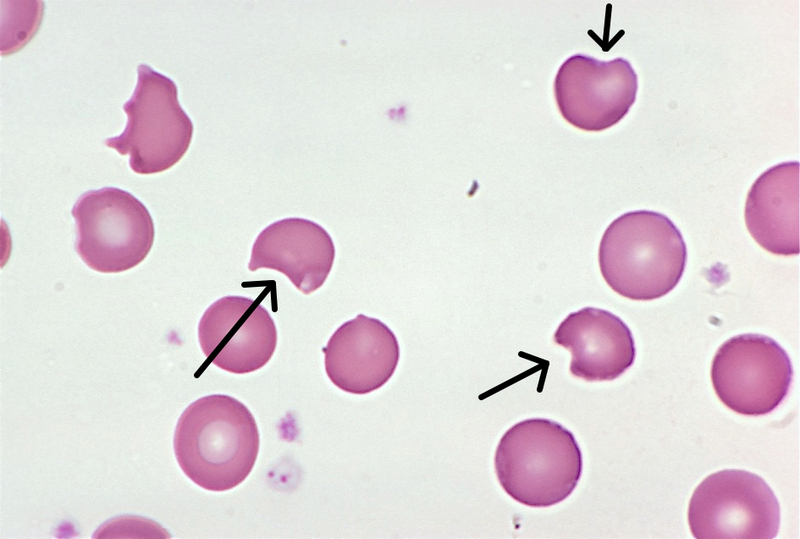 Several bite cells are visible in this patient’s blood smear (arrows). Most episodes of hemolysis in patients with G6PD deficiency resolve on their own after the offending substance is removed.